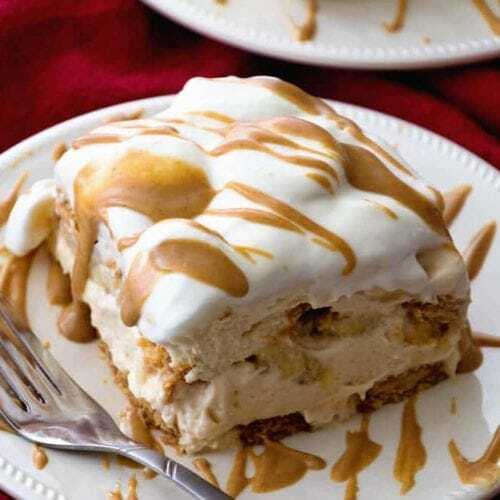 Peanut Butter and Banana Icebox Cake ~ Homemade Light & Fluffy Peanut Butter Mousse Layered with Peanut Butter Cookies and Bananas and then Drizzled with Peanut Butter! The Perfect No Bake Dessert! Ever since I was first introduced to Icebox Cakes I was in love! Can you believe I hadn’t made one or even heard of one until I started blogging? Obviously I was missing out on an epic dessert! 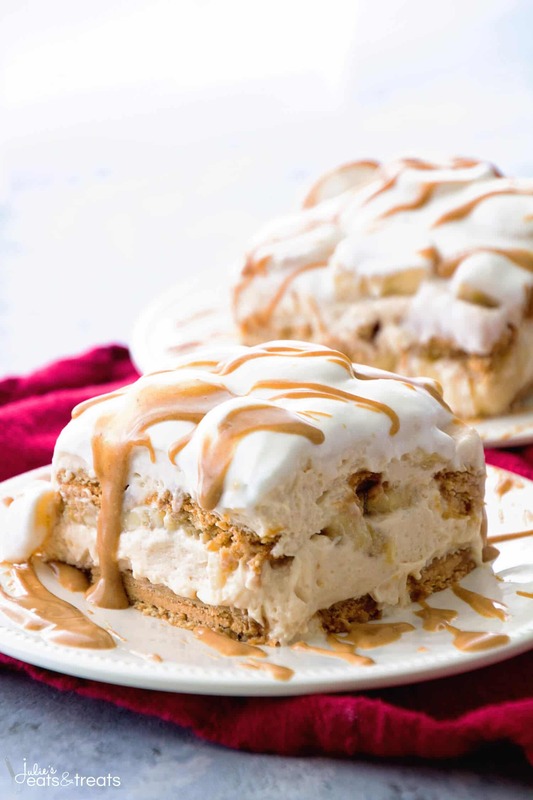 You guys have loved my No Bake Strawberry Cheesecake Icebox Cake, Peanut Butter Fudge Icebox Cake, and my first ever icebox cake – Skinny Strawberry Banana Ice Box Cake. They are some of my favorite summer desserts because they are no bake! I know when it’s HOT outside and HUMID the last thing I look forward to doing is turning on my oven. I’m sure you are right there with me. When my dear friend Julianne of Beyond Frosting came out with her new cookbook No-Bake Treats I knew I was going to be in love with it. First of all, Julianne is simply a dessert genius. You guys, I drool every time I see one of her recipes. They are gorgeous and the flavors are amazing! I’ll admit it. When I saw this combo of peanut butter and banana I knew it was going to be heaven on earth. How could I not love this icebox cake? Usually when making an icebox cake I take the easy way and grab an tub of Cool Whip and throw it together. When I saw that Julianne made her own peanut butter mousse I knew this was going to top any icebox cake I had ever made! You guys, it was totally worth the extra fifteen minutes it took to make this dessert. I pretty much wanted to face plant in the dessert. I’m pretty sure I could have downed the entire dessert in one sitting if I had put my mind to it, but logic won out and I saved a piece for my hubs! You could find me licking out the bowl full of peanut butter mousse though! 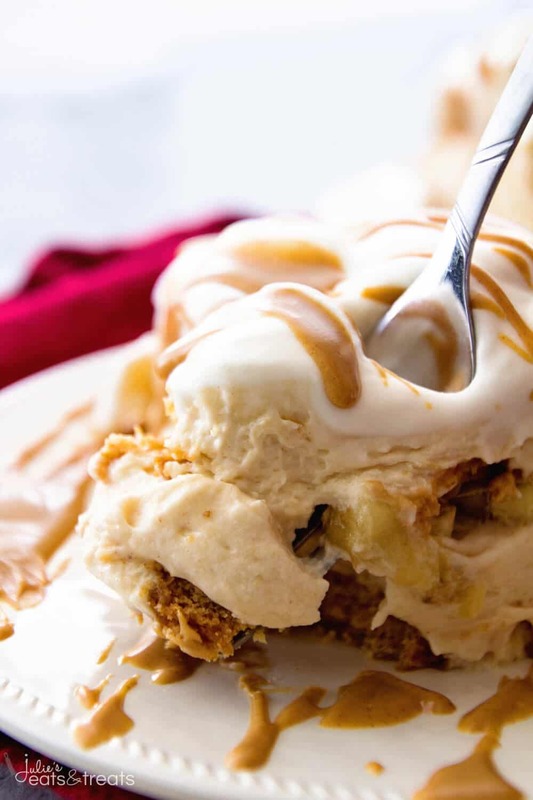 This Peanut Butter and Banana Icebox Cake has layers of peanut butter cookies, homemade peanut butter mousse and bananas that will have you drooling and fighting over the last piece! Trust me, I may have threw elbows to get it! 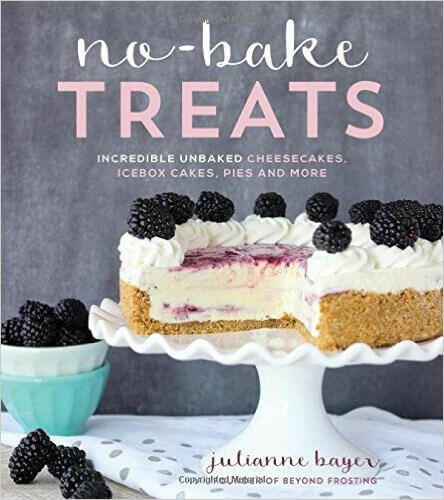 There’s still plenty of hot weather left to enjoy all of the No Bake Desserts in Julianne’s fabulous recipe book! There were so many recipes that had me drooling like her Banana Pudding Cheesecake, Brownie Batter Cheesecake, and Birthday Cake Lasagna just to name a few! 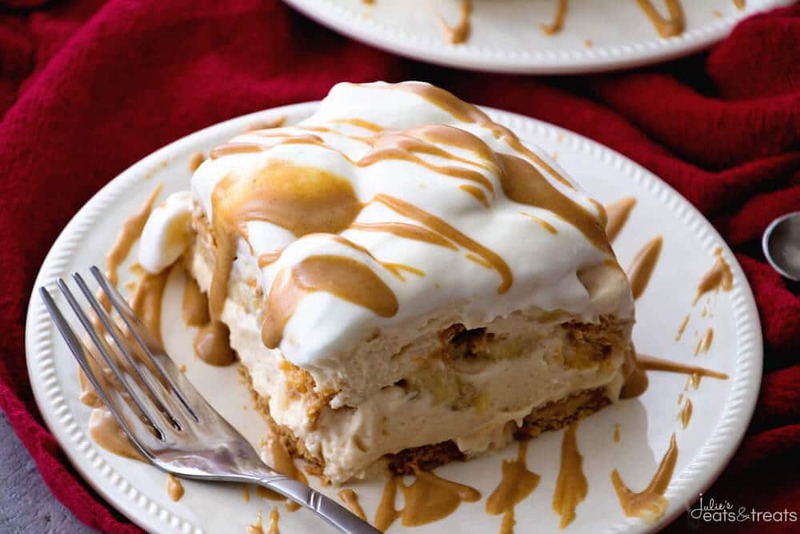 If you love bananas as much as me make sure you try this Banana Pudding! Like Julianne says, “Incredible Unbaked Cheesecakes, Icebox Cakes, Pies & Tarts, Ice Cream and More!” You can’t pass that up! No Bake Strawberry Cheesecake Icebox Cake Recipe ~ This Easy, No-Bake Dessert is Perfect for the Hot Summer Months or Anytime! 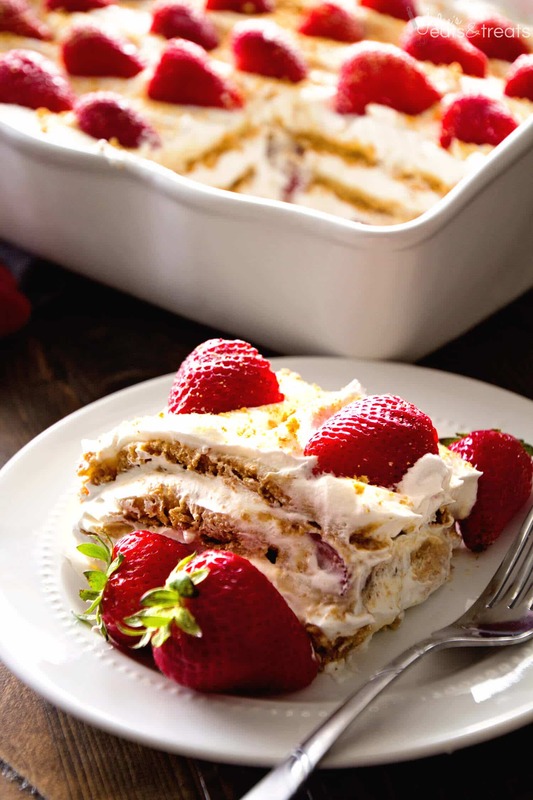 Layers of Cheesecake Pudding, Cool Whip, Graham Crackers, and Fresh Strawberries Make this a Refreshing Dessert! 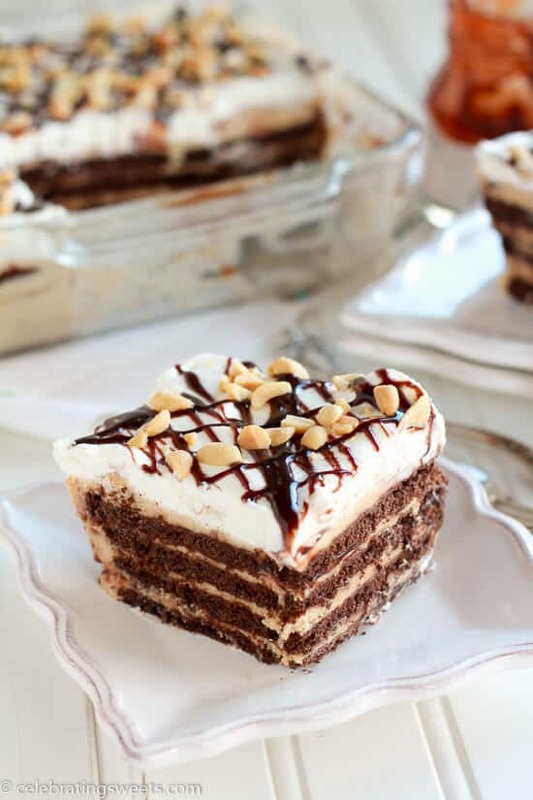 Peanut Butter Fudge Icebox Cake ~ A creamy and decadent no-bake dessert filled with layers of chocolate graham crackers, peanut butter cream, hot fudge sauce, and whipped cream! 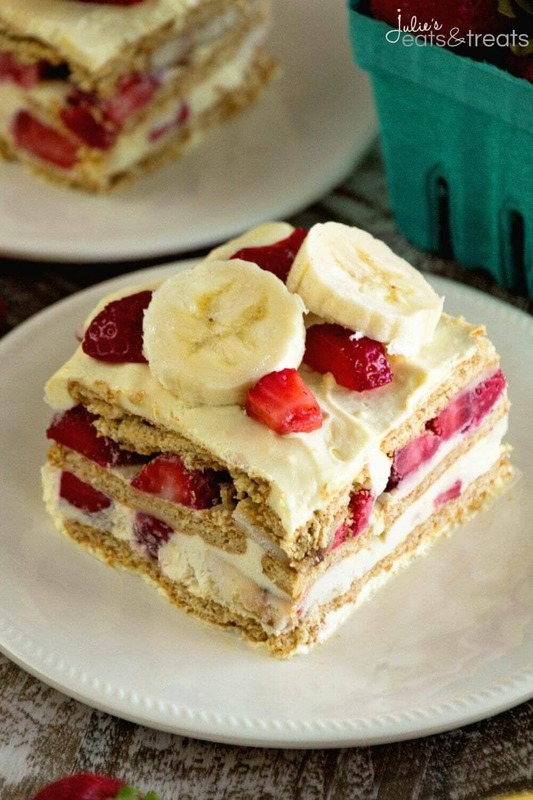 Skinny Strawberry Banana Ice Box Cake Recipe ~ Easy, Traditional Ice Box Cake Recipe Stuffed with Bananas, Strawberries, Graham Crackers and Vanilla Pudding! Plus it’s Lightened Up for a Guilt Free Dessert! This looks really delicious! Thanks for sharing. Wowza, this looks so good! That cream cheese and peanut butter combo is calling my name! Just curious. Could I make this on Tuesday to serve on Thursday at lunch? How long does an icebox cake last in the refrigerator? I wouldn’t recommend making this more than 24 hours before serving.